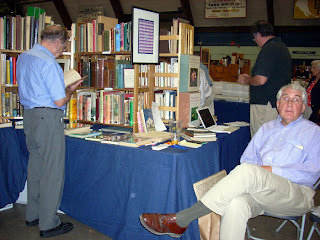 I did get up to the Concord Book fair, despite not setting up a table. And I made the rounds handing out the book repair supply price list and spent a goodly amount of time explaining to every third dealer ‘why I hadn’t set up a table’. I can’t justify the table rent unless a fair at least breaks even, and as we both know the last 3 didn’t even do that. Hopefully by this time next year I will be rolling in it enough that I can do all the fairs even at a loss and write them off as advertising expenses.…yeah i know in my dreams, yeah. 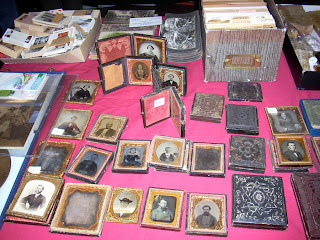 My friends at Gilann Books, from CT had this collection of daguerreotypes which I found fascinating as all get out. These were the size that people carried in their breast pocket to remind them of a loved one – kinda sad – nameless folks now reduced to photo novelties. 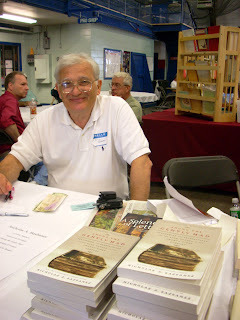 Orville Haberman from Connecticut River Books was one of the few folks I bought books from…no it wasn’t for me, it was for someone else, I don’t buy books for myself anymore…at least not with money. 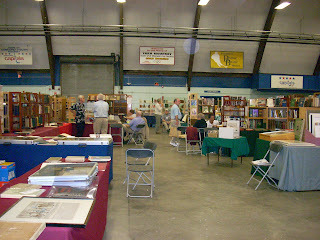 According to all the sellers I spoke to, a good fair was had by all. of course I miss out on the profitable one. Nick says he was playing bookseller, flogging a shelf or two of books that were not written by himself. – but that’s the essence of bookselling, selling the books you don’t collect want to pay for ones you do. 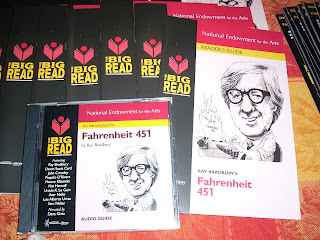 The people from the New Hampshire Center for the Book had a table set promoting the National Endowment for the art’s Big Read program sort of a ‘one book one state’ featuring Bradbury’s Fahrenheit 451. Giving out reader’s guides, CD’s filled with commentary and pencils (but i’m an eraser gal) the only thing they weren’t loading you up with is the book itself. Nice folks.